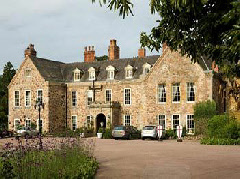 The main hotel building of Rothley Court may well be mostly 17th and 18th century, but the history of the site dates back at least as far as the time of the Domesday Book. However, much as the main house is impressive in itself, it is the adjoining chapel which is breathtakingly historic. Constructed during the 13th century, it was once a Preceptory belonging to the Knights Templar (these having been given the manor by Henry III). It is, as such, a truly important site in both British and European terms. It is also worth noting that the building was once the property of Thomas Babington MP. He and William Wilberforce spent considerable amounts of time together at Rothley working on bills to abolish the slave trade, and other parliamentary matters. Accommodation at Rothley Court is split between the main house and a converted mews, with Superior Rooms located in the former. Dining options are available via the hotel’s Babington Restaurant, while the Babington Bar serves afternoon teas.